Wow, the temperatures really dropped in November, especially the nighttime lows with several mornings around freezing. The okra, for the most part, has discontinued to produce. The eggplant continues to steadily produce at a slower pace. I have been able to cut back significantly on the watering and most of the water I am using now is rain capture water. The pepper plants are doing well and the first of the red peppers are being harvested. The melon plants have died back with the colder weather, but a few melons were harvested. The tomato plants continue to do well, though no fruit yet to harvest. The carrots, lettuce, kale, cabbage, snow peas, bok choy, cilantro, dill, sage, chives, endive, broccoli, cauliflower, beets, mustard greens, spinach, onions, garlic and chard are all doing well. I have harvested a couple of bunches of bok choy so far this month and expect the first of the savoy cabbages to be ready in a couple weeks. The snow peas have begun to flower. I really love snow peas, so I have these planted in 3 different locations of the yard and each were started a few weeks apart. I have harvested about 3 dozen pomegranates so far with another couple dozen left to harvest over the next week or so. You can tell when these are starting to be ripe as the birds arrive to feast. The cosmos and tidy tips continue to bloom and the nasturtiums and borage are doing well and should be flowering in the next few weeks. I planted some poppies in a warmer location near our banana trees and these are doing well. 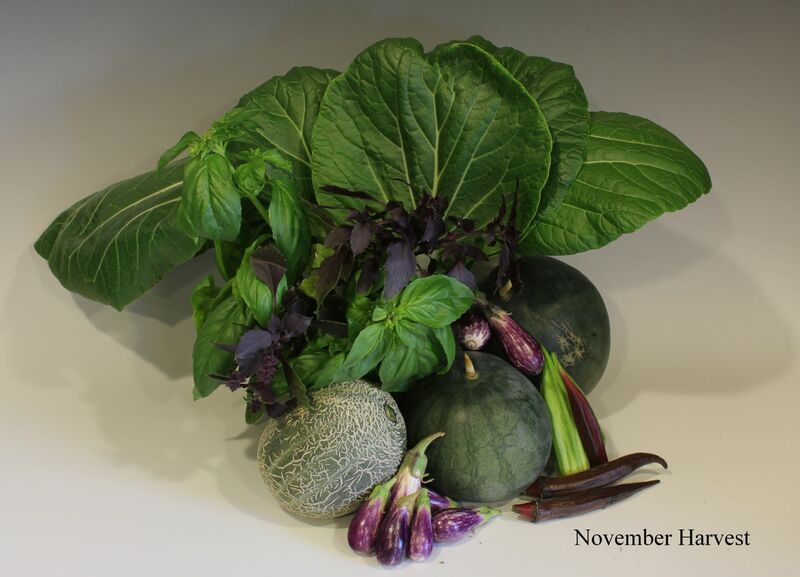 November Harvest picture - Bok Choy, purple and green Basil, Eggplant, Okra, Watermelon and Cantaloupe. The Corsican gourd vine has multiple gourds growing. A new cantaloupe volunteer has many fruits and seems to be fairing the cold pretty well as it is located next to a south wall. The herbs continue to do well with the cilantro taking off in the colder weather. I planted endive seeds for the first time in November and happy to report that all have sprouted. The snow peas are beginning to flower and the first of the savoy cabbage should be ready in a couple weeks. The cauliflower really likes the cooler temps and should start producing soon. Most of the pomegranates have been harvested with just a couple dozen left to harvest. The gourd vine suffered some frost damage the last week of November. The birds took a toll on the pomegranates as they managed to eat through about a dozen fruits. The Zucchini plant finally succumbed to the cooler weather. Though it continued to survive, the fruit did not grow bigger than a few inches. I pulled it and will plant again in the spring. The pepper and tomato plants will be very sensitive to the colder weather. Covering these plants with garden cloth is recommended to protect from the frost. A thick layer of mulch (4" - 6") will help keep the roots warmer. Gardening in cold weather is not as hard as you think. The key is to grow the right types of plants and give them a south facing location. Carrots, Broccoli, Brussel sprouts sweet peas, and lettuce are all good choices. I will begin to cover the most exposed planting areas/beds with a light weight garden cloth to keep them warmer and protect them from any frost. I use flexible plastic stakes and PVC tubing to keep the cloth above the tops of the plants I am protecting. 1. Remove dead and damaged wood from shade trees. 2. Leaving roots in the ground, cut tops off spent perennials. 3. Plant shrubs, bare root fruit trees and spring bulbs. 4. Pick tomatoes before the first frost. 5. Mulch any bare soil and protect plants from frost. 6. Prune pomegranate's after the fruit is harvested during dormancy in December and January. 1. Don't pick grapefruit yet. Grapefruit are best in late spring and early summer. 2. Don't fertilize trees or shrubs in December, wait until spring. 4. Don't ignore pest problems. • Vegetables: Asparagus, Beets, Bok choy, Broccoli, Cabbage, Carrots, Cauliflower, Collard greens, Lettuce, Mustard, Green Onions, Peas, Radishes, Spinach, Turnips. • Herbs: Borage, Caraway, Cilantro, Chives, Dill, Fennel, Feverfew, Lavender, Parsley, Rosemary. • Fruit: Bare root - Apple, Apricot, Blackberry, Fig, Peach, Pear, Plum Pomegranate. Pineapple Guava. I will begin propagating seeds for pepper, zucchini, eggplant & tomato spring transplants indoors using a grow light system in December. 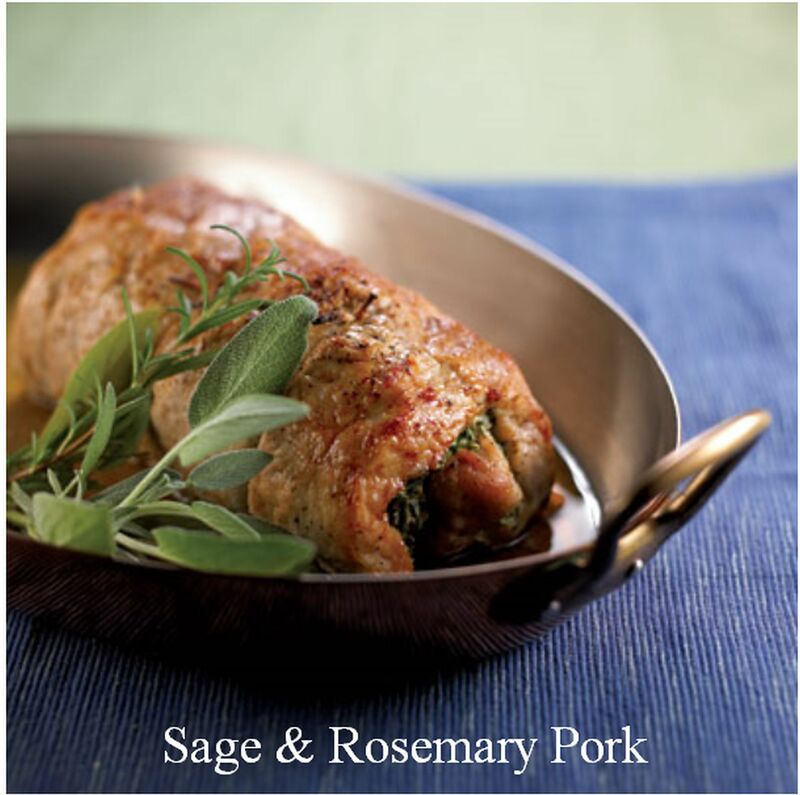 - Sage and Rosemary Pork - This months recipe inspired by the renewed growth of all the herbs needed for this recipe. Click on the title to see the picture. Q: Can I grow tomato plants in higher altitude and or cooler conditions? A: Yes, see below a few conditions that must be met in order to have success growing tomato plants in cooler temperatures. - Don’t start plants too early. Sow seeds indoors 6 to 8 weeks before transplanting outside. Plant them 1/8 inch deep in sterile seed starting mix in flats or cells. Seeds germinate best at 75 F to 90 F. Then grow transplants at about 70 F.
- Don’t rush to transplant, either. Cold soil and air temperatures can stress plants. Wait at least a week or two after the last frost. Nighttime temperatures should be consistently above 45 F. Use black plastic mulch to warm soil and/or row covers, hot caps or other protection to keep plants warm early in the season. Remove covers whenever temperatures exceed 85 F.
- Harden off plants before transplanting by reducing water and fertilizer, not by exposing to cold temperatures, which can stress them and stunt growth. Transplants exposed to cold temperatures (60 F to 65 F day and 50 F to 60 F night) are more prone to cat-facing. - Transplants: If you purchase transplants, look for sturdy, short, dark green plants. Avoid plants that are tall, leggy, or yellowish, or have started flowering. Transplants that are too mature often stall after transplanting while younger, smaller plants pass them by, producing earlier and more fruit. Choose determinate varieties for early harvest or cool conditions. Compact varieties are also good choices for containers and planting in flower beds.